Bumbeck: Because you need a super duty heavy hauler possessing nearly unlimited power along with with a degree of factory installed luxury and exterior style. Because you enjoy being able to move around an extremely large pickup truck with ridiculous ease at the touch of the throttle. Because you cannot live without the sound of diesels and turbochargers. Because you and Hoss have some stumps to pull. Loverman: You are a torque junky. Forget heroin; the worm-drive feeling of unstoppable forward thrust is the greatest drug of them all. You have a large boat/trailer/camper/horse that needs to be moved around. It looks like pure evil, but in a good way. You will never get cut off again. If you like to sit high, man, this truck is a head above. You always wanted to be a bus driver. If you get the eight-foot bed, you can get the 38-gallon tank, which is almost big enough for 900-mile diaper-clad dashes to Florida. 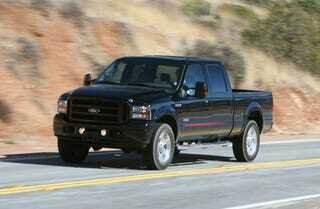 Loverman: The F250 drives and rides like a paint jogger. It is socially irresponsible, not because of climate change, but because if you hit Bumbeck's Starlet, you're a murderer. Of both Bumbeck and Starlet. The F250 has more capability than you need. Even Ford's PR guy was having a hard time coming up with something besides "a really big boat" that weighs 15,000 lbs. Even with the sorta-from-certain-angles acceptable mileage, it costs $90 to fill the tank. Think of all the other great cars you could get for $50K. Bumbeck: Because you feel the need to drive around in traffic like David Pearson at the 1969 Daytona 500. Because you want a practical commuter on a budget. Because you want to pretend as if you could tow or haul when you know you never will.